Laney College's BEST Center this month celebrates the renewal of a grant received in 2012 from the Advanced Technological Education (ATE) Division of the National Science Foundation to establish the BEST Center. The grant renewal, totaling $3.6 million, will run through the end of September 2022, pending further renewals. With a mission to support the development of community college career education programs in energy efficient commercial heating and air conditioning, building automation systems, and energy management, the BEST Center (its name is an acronym meaning Building Efficiency for a Sustainable Tomorrow) shares a vocation with the ATE, which is described on the NSF website as a program that "strengthens the skills of technicians whose work is vitally important to the nation's prosperity and security." 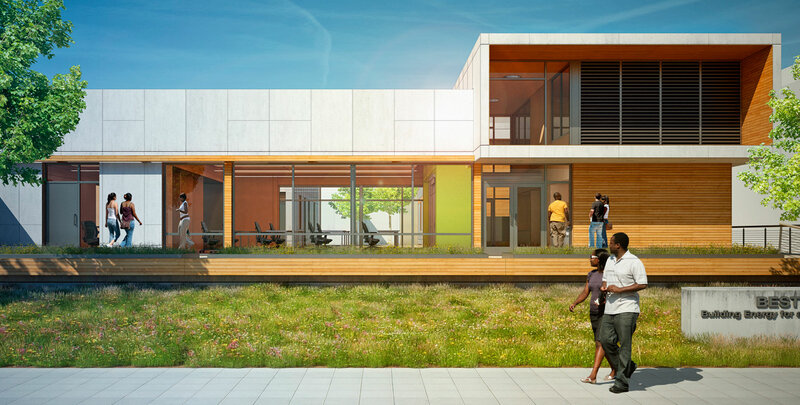 The BEST Center trains students in green construction practices and demonstrates principles for design and construction of Zero Net Energy buildings. Flad's design of the center recognizes the program's three distinct learning methodologies by housing them in three separate structures. Two "Test Houses," the Building Performance Institute (or "BPI House") and the Lab House, support practical training for sustainable construction techniques and alternate mechanical systems, respectively. The third structure, the "Passive Classroom," is designed to meet net-zero energy use through a high-performance envelope and onsite renewable energy in the form of photovoltaic panels. The two test houses are constructed to reflect typical conditions that might be encountered in market-rate housing, while the classroom is designed to meet rigorous "Passivhaus" standards for ultra-low energy use, achieved by a highly insulated perimeter, minimal thermal bridging and an extremely high level of air-tightness. Environmental goals are addressed through LEED certification, and the center has been designed to achieve Platinum, the highest level of performance in the LEED rating system. Laney College, in Oakland, Calif., is well-situated to meet California's 2020 Zero Net Energy (ZNE) goals. Earlier this year, Laney College launched the first training program in the nation for achieving zero-net-energy in commercial buildings.